You can find Tabi's yarns at Sericin Silkworks here and here on Ravelry. Where do you find inspiration for your colourways? Every trip to the dye pot is different. Sometimes it’s the inspiration of the day... Sometimes it’s something from one of the fashion/design/architecture blogs I follow. Sometimes I think about a favourite customer’s colours, wondering if the yarn will end up in their hands. How do you choose the fibers that you work with? 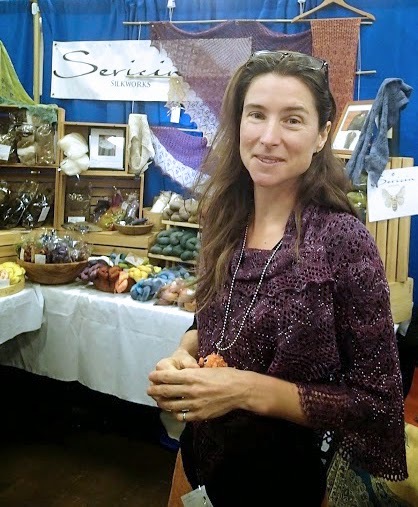 When I created Sericin, I envisioned the type of finished projects that would be created from my yarns: heirloom shawls, fine weaving, elegant accessories, perhaps a few fine sweaters. Truly special pieces in your wardrobe. I’ve always been attracted to silk and the luxury fibers that work best with it so I have been hand dyeing cashmere, qiviut, mink, and buffalo for a few years. I’m intrigued by how dye takes to different fibers. I source many fibers in their natural colours rather than bleached, which is most common in the industry. Natural colours take the dye subtly creating intensity and warmth. How did you determine what weights of yarn you stock? Could you give us an idea of how long the process is to dye a batch of yarn and prepare it for sale? Silk takes a little longer to prep than other fibers as it requires overnight pre-soaking. If I know I want to dye the next day I have to make sure I have the fibers soaking the night before. So, it’s a 3 day process. Soak, dye, dry. Then inventory, label and photo although this is usually batched with other finished yarns and fibers. Do you look at other dyers’ work or are you afraid that you will be influenced by their yarns? With the Internet it’s impossible not to look at other dyers’ work, and there are certainly some dyers’ work I admire but every trip to the dye pot is unique and everyday’s inspiration is different, so I don’t think I’m influenced. I also work with different fibers than most dyers, possibly different dyes and I mix from powder every time so results are different. Are you a knitter as well? Absolutely! And a spinner. For me, spinning was the key to understanding fiber and yarn. Access to hand dyed silks for spinning is what led me to dyeing. Dyeing yarn was the next logical step. I also create designs to accompany my yarns. I don’t have a formal business plan, but I start the year with a budget and show/event plan. I lay out a dyeing schedule usually a few months in advance of each show and try to introduce one or two new products a year. Everything is inventoried when it comes in, after it’s dyed and when it sells to try and keep on top of things so tax time is as painless as possible. I don’t have a specific mentor but I find inspiration and support from my friends many of whom are knitters and spinners. I love the fact that we all have different strengths and styles. Can I do a little shout-out here to my friends? Linda Choo, a prolific lace designer and hand spinner. I don’t think she sleeps. SelinaS, also a designer with a very mathematically astute brain. I love seeing how her clever patterns work. Laurie B who spins sheep and quietly knits up a storm. Karen Crouch and her wonderful crew at Shall We Knit? in Waterloo. Local guilds are also a source of inspiration and motivation. There are so many talented people! I have primarily been focusing on shows for the last few years because I enjoy the interaction and inspiration I get from my customers. However the Internet has been a large portion of my business as well. I’ve had an Etsy shop since 2007, I opened Sericin on Etsy in 2010. Ravelry is an amazing phenomenon. As a retired software developer, I’m impressed by its architecture and design. As a knitter/spinner/designer/indie dyer, it’s a godsend. My plan for 2014 is to grow the Internet/Ravelry/Etsy side of the business. I’m not giving up shows though! They’re too much fun. The few weeks before a show are a little crazy, but I find if I keep on schedule I’m OK. I always try to finish up with 4 or 5 days to spare from dyeing for the little things that always pop up and to mentally relax so I’m fresh for the customers. I try to maintain a healthy, active lifestyle and I’m exceptionally lucky to have a wonderful partner, Matt Kadey, who is a cookbook author and recipe developer, so I’m very well nourished. Sericin doesn’t support me, but it does provide a significant portion of my living expenses so I do rely on it. What advice would you give someone who wants to pursue a career in hand dyeing yarns? That’s a tough one. There are inherent dangers associated with dyeing that are always in the back of my mind. I try to minimize the environmental aspect: no plastic wrap, reuse gloves until they break down, dyes fully exhausted and natural mordants. I mostly use chemical dyes but in the fall I do a batch of natural dyes. If you’re going to do large scale dyeing, make sure you have proper ventilation and a dedicated area. While we get carried away creating beautiful colours, always keep in mind that you have to sell all that beautiful yarn too. The marketing and selling is just as large, if not a larger part of the business as the actual dyeing.